A trademark is used to label goods or services of a company. A label can be protected if it distinguishes goods or services of a company from those of other companies. They can be words, letters, numbers, images, colors, three-dimensional compositions, and sound signals. Registering a trademark gives the owner the exclusive right to use the trademark for protected goods and/or services and to prohibit its use by others. However, the rights arising from the trademark can only be enforced and definitive if the owner seriously uses the trademark for a specific period, and if he does not suspend its use for a specific period. Trademark protection can be acquired in different manners. The most common way is to present an application with the competent administration. The filed trademark is examined regarding absolute grounds for refusal. Reasons for refusal include the suitability of the trademark to distinguish the claimed goods and services from those of other companies, and examining whether the trademark consists exclusively of characters or designations which regarding the goods and services belonging to the trademark, must be kept in the public domain, and thus cannot be registered as a trademark. If there are no absolute grounds for refusal, the trademark is registered. The protection starts with the registration of the trademark. It is important to know that the administrative office does not check whether an identical or similar trademark of another person is already protected. The trademark applicant must find this out on his own before applying for a registration and using his trademark in order to avoid infringement and cost risks. Next to an administrative registration, a trademark protection can also arise from secondary meaning resulting from intensive use of a label in the course of business or through notoriety. In practice, it is however extremely difficult to prove secondary meaning. 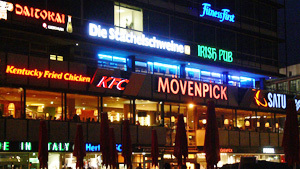 A German trademark protection can be renewed indefinitely every 10 years.